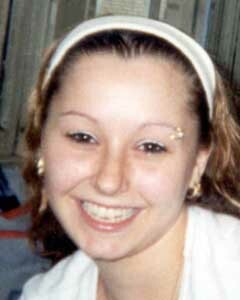 This site is dedicated to finding Amanda Berry. Amanda started walking the three blocks home from her job at Burger King just after 7:30pm on April 21, 2003. She was reportedly seen getting into a white 4-door sedan with three male occupants. At approximately 7:45pm Amanda spoke with her sister by cell phone, stating she had a ride home. Her disappearance is out of character, as the next day was her birthday and all her possessions including cash were left behind. One week after Amanda's disappearance, her mother received a strange phone call from an unidentified male using Amanda's cell phone. The FBI is involved. Last Seen Wearing: Burgundy Burger King shirt, black pants and a black hooded jacket. Other: Surgical scar on lower abdomen and pierced left eyebrow.